We speak to Astrid S about 'Breathe,' Scandi-pop and her new EP. 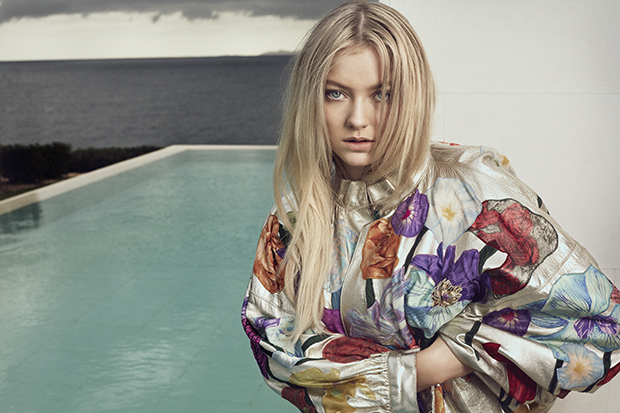 After three years of non-stop touring and promotion, Astrid S took a well-earned break at the end of last year to reevaluate her art and tinker away on a track called “Emotion.” The Norwegian pop star recorded the demo in early 2017 with producer Ali Payami and instantly knew it was a special song that conveyed thoughts and feelings she had been wanting to express for a very long time. 18 months and several drafts later, “Emotion” arrives today (October 12) in — believe it or not — close to its original form. “I wouldn’t say we wasted a year though,” the “Breathe” hitmaker laughs. “I think it was really important for me to try everything and turn every stone.” That care and attention to detail is evident from the first listen. This is a new sound for Astrid. She sounds more vulnerable and soulful than ever before, wearing her heart on her sleeve as she finally puts an end to a destructive relationship. I recently had a chat with the 21-year-old about the jarringly-good single and her upcoming debut LP. Find out more about the project in our Q&A below. Congratulations on “Emotion,” I love the song! It’s a slightly different sound for you — more mature and soulful. Is that what you were aiming for? Both yes and no, I would say. I think it’s the kind of song that I’ve always wanted to make and it’s the best feeling in the world that I’ve finally been able to make it after so long. I don’t think I’ve been aiming to do something more mature and soulful. I think it’s probably because I have grown and I am more mature now. It just happened in the studio. This song just came out. Who did you work with on the song? I worked with a producer called Ali Payami. He’s Swedish. Yeah. He’s really, really great. What was the inspiration for the song? Was it based on something personal? Ali played me some music. Usually, I like to start off by making melodies. So before I listen to the track too many times, I just record anything that comes to mind and try to come up with lyrics while I do it. Anything that I’m feeling or the track makes me feel. The lyric “Did you forget that I’ve got a thing called emotion?” came up pretty early. And that was the staring point to the story. I remember after we made the melody, I just sat down and tried to think of what that sentence made me feel, what the word emotion made me feel. Then this story came up that’s been on my mind for a long time and it just felt right to talk about it in the studio. Most of my lyrics are straight to the point and super easy to understand, very literal. This is more vague, I think Basically it’s just about dynamics in a relationship — be it a love relationship or a friendship, or with someone in your family, or even yourself. I think sometimes people can be very mean with words and how they treat people and this song in particular is about a relationship where someone had me wrapped around their finger. The things they would say, I would just take it. I became kind of a punching bag for them to just say whatever and it made me feel really bad. And this song is kind of the breaking point where I’ve had enough and I don’t wanna take it anymore. Which is, I think, what I really love about the song is that it can be anyone and I think that can happen in a lot of relationships and also sometimes it can even be yourself. You can be your biggest enemy and make yourself feel bad. Are you nervous or excited to see how fans react to the song? Now I’m very excited, but it’s been a rollercoaster of emotions. It has been such a long time since I’ve released music and I’ve just worked really, really hard on the music. The song is so personal. It is my favorite song that I’ve ever made. The lyrics have been in my head for so long. So I’ve been nervous and really scared and terrified and now, finally. I feel excited about it. Have you already filmed a video for “Emotion”? Yeah, I just shot it. I came home today actually from Iceland. I spent the past three days shooting it there. But it’s a music video that is relying a lot on the post-production, so I have no idea what it’s gonna look like, if it’s gonna look good or not. That is kind of scary. But I think you have to take chances and that’s what’s gonna take me a step further. So we’ll see how it turns out, but I think it’s gonna be really good. Is “Emotion” part of an EP, or are you finally going to release an album? I’m finally gonna release an album! I’ve been releasing music for almost five years now, but I haven’t released an album yet, so it’s gonna be my debut album. That’s really crazy to me. So “Emotion” is the first single from my debut album. It’s very exciting but also a bit risky because it’s one of a kind and nothing else sounds like it. So moving forward, it’s not like the songs are going to be similar to “Emotion.” It just has its own identity and personality, but hopefully all of my songs will sound like the more mature me. Will you put previous singles like “Breathe” and “Hurts So Good” on the album? Hopefully I’ll have enough songs that I feel are really great and amazing, so it will just be new material on the album. Because I do feel like I’ve grown a lot in the past couple years and I think it would maybe feel like a step backwards if I were to add old songs. That chapter has closed now, so I’m aiming to make new music to put on the album. Even though I really love the previous stuff as well. That’s fair. Can I ask where “Think Before I Talk” fits into things? I think it’s a one-off song. We were actually debating on if we should release “Think Before I Talk” or “Emotion” as the lead single. “Emotion” is actually a pretty old song of mine. But we released “Think Before I Talk” and we were aiming to have the follow up single be “Emotion.” But, at the time, I had done three years of touring and promotion and writing, so I felt a little bit overwhelmed and I wanted to have some more time to make “Emotion” perfect and really figure out how to grow as a songwriter and artist, so we put on the brakes for a little bit. It’s interesting that “Emotion” has been around for a while. Do you often work on songs for a longer period of time? Yes, but I think “Emotion” has taken the longest time. Usually, it will be half a year from when I write the song ’til it gets mastered and maybe released. But I wrote “Emotion” in March 2017. It’s actually quite interesting because I spent a lot of time trying to rewrite the lyrics. We’ve been going back and forth, trying so many different things from turning up the trumpet to taking out some stuff to adding stuff and even speeding it up and down. Funnily enough, we actually ended up finishing the demo version from the day we wrote it. I wouldn’t say we wasted a year though. [Laughs]. I think it was really important for me to try everything and turn every stone. There are always a lot of opinions from people that I work with and I think it’s important to respect all of those opinions and just try to see where it goes. But it has been a really cool learning experience. There’s always something magical about the demo, so I’m happy we went with the original. Do you have any more songs with Ali on the album? I worked some more with Cass Lowe, the producer I did “Such A Boy” with, the Wolf Cousins and a guy called Oscar Holter. Lots of new people as well. Basically, I was in the studio from January until June. I also worked with this British team called PMS and we have a song I really, really love. I’m excited about that one. Are you focussing more on the US and UK with “Emotion” or are you still seeing what happens? I think that’s a good question. I usually just focus on making the best music possible and hoping that obviously as many people are going to connect and love it as much as I do. I have really great people around me who are focused on that, so that I can focus on just making the best music possible. Good luck with “Emotion.” Nice to talk to you again. Thank you so much. Bye! Do you love Astrid’s new single? Let us know below, or by hitting us up on Facebook and Twitter!